Summer time is one of my favorite times because the pan fish are spawning and the fishing is great. Latta Flynn Boyle is a pond we first discovered in 2001. That first summer was enough to show us the fun of that water. We caught enough large bluegills that we visit it as often as possible. At Latta Flynn Boyle the bluegill take almost anything that is thrown at them. On any given summer night it's not unlikely to hook into a dozen or so before the sun goes down. 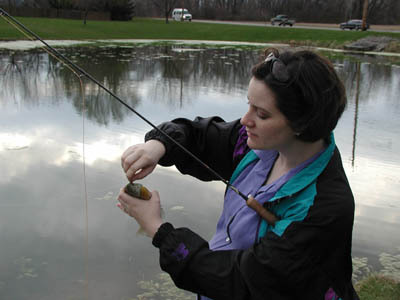 It was April 12th of 2002 when my wife and I headed out for our first fishing trip of the summer (yes, I know April is during the spring time). I had to work that friday to help support my fishing habit so we didn't get to the water until about 6:30pm. It had been in the high 70's for the day but had started to cool of by the time we hit the water. Crystal started off using a popper. She determined quickly that it was much to large for so early in the season. She had me switch it up for her. Still to this day I don't understand why a woman who will touch fish has me tie on a new fly. I don't mind, it's just an observation I've made. Shortly after changing to a smaller red tailed popper she caught the first fish of the new year. It was a medium sized bluegill. She caught the second fish of the new year about15 minutes later. I was still trying to figure out what to use. My purple body mohawk fly wasn't working like I had hoped. I had figured that early in the spring I would have to fish subsurface in order to catch anything. I was wrong. Do you need that in bold??? I WAS WRONG. I quickly switched to a Silver Tailed Yellow Back and fished him with great hopes. I got hits within a few casts. I could see that the fish weren't taking the fly by the mouth but merely brushing up against it with their bodies. It's a little harder to legally catch fish when they aren't bitting. 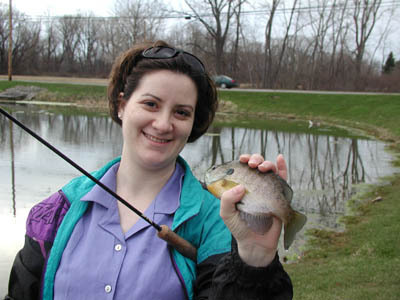 I remained patient and soon enough I caught my first bluegill of the year. She was a beauty. I kept that fly on for the rest of the night. I ended up catching 3 bluegills when it was all said and done. Crystal caught 2.